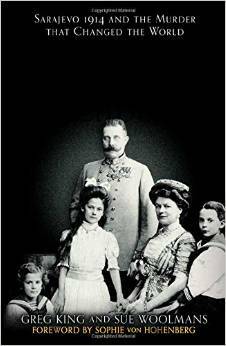 A Hundred years ago this summer, the Heir to the Austro-Hungarian Empire, & his beautiful wife Sophie, were shot by a Serbian nationalist on an obscure street corner in Sarejevo. Within a matter of weeks the whole world collapsed into a conflict which would eventually touch every nation on the planet. But who was the man whose death set off the whole thing, the target of the ‘shot which rang around the world.’ Sue Woolmans has had an interest such matter for the best part of three decades & with the help of Greg King has co-written a book that reveals the real Arch-Duke, a man very much for peace & for the development of a feudal Europe very much like the one we have today. Woolmans cast a spell over the Charlotte Square audience with a wonderful half-hour talk, showing us the struggle that the Arch-Duke had in gaining acceptance for the love of his life, his wife Sophie. The Austrian court considered her a lesser-born – she was only a countess – & her journey into acceptance was, as chair Roy Cross said, something of a soap opera. The Q&As were vigorous, & Woolmans answered as if it was her specialist subject on master-mind. If the book is anything to go by her talk, then it should make a fascinating, & gripping read, with the shadows of the assassination ever approaching.